A Capitol Hill Benefits District? The map above is striking. There’s clearly a core of Seattle — including Fremont, the University District, and Capitol Hill — that supported Prop 1, and for good reason. I wonder: what would a Transportation Benefit District look like for one or more of the neighborhoods above. Prop. 1 would have raised on the order of $200M over 10 years. The South Lake Union Local Improvement District raised $25M to fund the Streetcar. Could the residents of the Hill & the Central District come together to raise, say, $30M over 10 years for transit, pedestrian, and bicycle improvements in the neighborhood? What would that buy us? Financing such a thing would be tricky. A LID would be an option, but it could be a big tax on local businesses and residents. Without a single landowner like Vulcan to muscle it through, it might not pass. Car tabs would seem to be unwieldy given the small geographic area and the low car ownership rate in the neighborhood. This not only would make something like Prop 1 pass, it would make it amazingly more cost effective. We would have wasted* a significant amount of money adding sidewalks to the further-out areas. 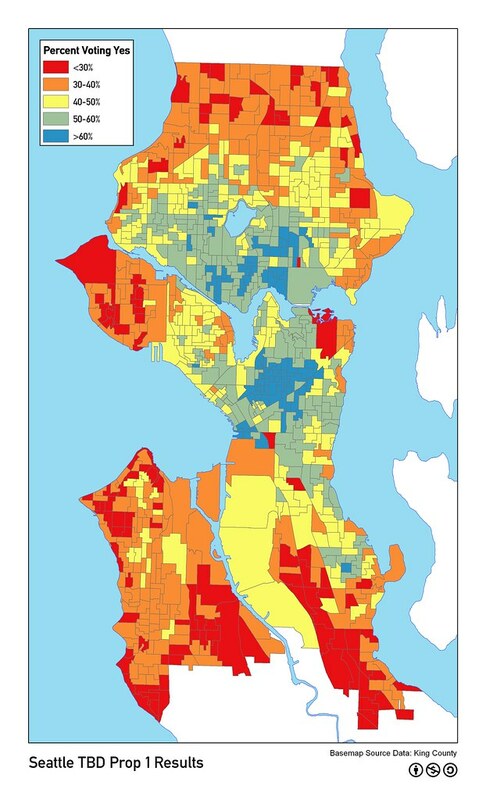 Rebuilding sidewalks is easier and cheaper than building new ones, and each foot of sidewalk serves far more people in Capital Hill than it would out in those red and orange areas. Yes, that’s just looking at the sidewalks. But the same works for the other services provided by Prop 1. The more density you have, the more valuable these services are. Each hour of bus service will help a whole lot more people. Each square foot of road repaving will help more bikers. Etc.